Recently I found a twitter post from WA1GOV about a new service he offers (). If you send an APRS message with the content “ISS” to the callsign WA1GOV-10, you will receive the next ISS pass at your location as a message. 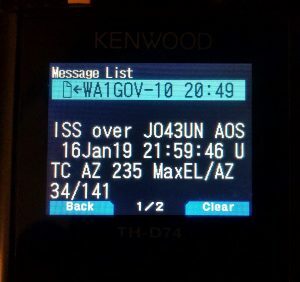 This entry was posted in APRS, English, ISS by DK3ML. Bookmark the permalink.